Mizuma Art Gallery is pleased to announce “Such a Loving, and Beautiful World”, an exhibition by SISYU+teamLab starting from June 5, 2012. The main piece, which gives its title to the exhibition, is the product of the collaboration between the work of calligrapher Sisyu and the “Ultra Technologist Group”, teamLab. It was first exhibited for 2 days in 2011 at the Ebisu Garden Place during the “Love Letter Project ’11” show, creating a sensation. In spring 2012, the work was awarded the “Architecture, Art & Culture Award” at the international contest “ReVolution” during “Laval Virtual”, Europe’s largest virtual reality salon. This exhibition is the upgraded version of the work. In the dark, kanji (Chinese characters) appear on the walls and go on falling slowly. When someone touches the characters, they change their shape by reacting to the person’s shadow. If the kanji is the character for “bird”, it turns into the image of a bird with spread out wings flying toward the character for “tree”; “butterflies” will snuggle up to the “flower” character and so on. As in the natural world there are no identical moments, animations come and go on the screen, generated in real-time in 3 dimensional space creating endless new landscapes. “A new world is created by overlapping and combining the Kanji’s world with that of Sisyu, the calligrapher, your own thoughts, and the thoughts of humankind that are contained in the origins of the characters.” As this work description reads, the relation between the characters and the visitors is based on the very simple and elementary action of “touching”. It shows us the endlessly renewed beauty of the changes in the world caused by our interaction with it. This work is also a homage to writing, one of the oldest interactive tools invented in ancient times by humans to communicate with each other, by re-interpreting it using the latest technology. We gladly invite you to experience this utterly new, yet nostalgic interactive art installation. A calligrapher, Sisyu has been practicing calligraphy since the age of 6. Through her calligraphy she breathes life into characters, charging them with images, emotions as well as information. Sisyu also actively promotes the use of Japanese traditional calligraphy globally as a universal way of “expressing Human will”. Formed in 2001: Representative: INOKO Toshiyuki. teamLab is an “Ultra Technologist Group” made of specialists such as programmers, engineers, mathematicians, architects, designers, CG animators, artists and more. 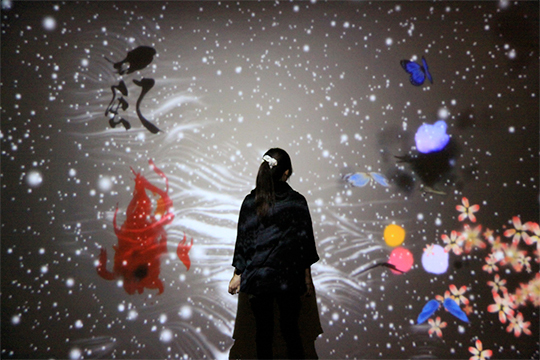 With “reinventing Japan” as their corporate motto, teamLab restlessly promotes Japan’s cutting edge technology and promotes it from Japan to the world. teamLab is exhibiting 10 works around four concepts: New Value in Behavior, Reality and Fiction, Mimetic Words and Ultra Subjective Space.